The Datacard® PB6500™ passport issuance system offers a wide range of advanced capabilities to enhance both program and document security, while minimizing overall program costs. This high-speed system features true field modularity which allows you to integrate new capabilities as they become available without investing in a new platform. The PB6500 system is part of a comprehensive passport portfolio, which includes enrollment and identity management software, post-issuance management software, consultative services, technical support and intelligent supplies. Discover how this system — and our complete portfolio — can help defend against ever-changing counterfeiting techniques without compromising efficiency. Reduce capital costs, waste and supplies. Configure for redundancy and efficiency. Improve productivity with high-speed laser and color inkjet technology. Reduce operating costs and maximize productivity. See how a European country improved the security of its passport and ID cards while making the enrollment more convenient and easy for its citizens. PersoCurve™, LaserTact, LaserShadow security features, 3D photos, laser ablation and more to significantly minimize forgeries and counterfeits. Leverage logical security features to protect demographics, biometrics and other proprietary information. Use Photo Optimization software to help reduce imposters at the borders. Accommodate specific security and productivity requirements with a system design that has true field modularity. New modules can be added at any time to implement new technologies. Personalize up to 300 passports per hour with an innovative, high-speed fiber laser that requires no external cooling or an inkjet module with an ultra-smooth transport. Produce more passports in less time — for less money. Issue a wider range of passport types, including e-passports. The chip encoding module is compatible with chips from a wide range of manufacturers. Use multiple input trays and selective picking software capabilities to run multiple booklet types. Enhance durability and security with highly secure overlays that use powerful adhesives to protect critical passport information. Protect documents and data with advanced personalization technologies. Incorporate Datacard LinkJet™, PersoCurve™, LaserTact, LaserShadow security features, 3D photos, laser ablation and more to significantly minimize forgeries and counterfeits. Leverage logical security features to protect demographics, biometrics and other proprietary information. Use Photo Optimization software to help reduce imposters at the borders. The system controller software controls the data flow and module operation throughout the personalization process, providing the operator with real-time updates via the best-in-class graphical interface. Module includes an audible light alarm pole, large 24” pole-mounted monitor, RAID configuration option. Feeds blank passport booklets into the system with high reliability. Capacity of 100 32-page booklets. Multiple input modules are available for added capacity or for more flexible production options. Innovative mechanics and optics help ensure accurate leafing and higher production yields. Automatically opens closed passport booklets to a specified page; confirms proper page prior to personalization; reads document identifiers. Inline CO2 laser, drills alpha-numeric characters or shapes (e.g., triangles, stars, diamonds, or squares) through all paper pages through back cover. Conical drilling pattern adds security. Suitable for smaller issuance locations – compact size, no water cooling required. Extraction system required for removal of paper dust. Module can be used as a stand-alone pre-personalization in addition to being part of a fully automated system. Economical fiber greyscale laser engraves photos, laser ablated images, tilted laser images (CLI, MLI, 3D photo), text, bar codes, a wide variety of Datacard security features, logos and other graphics with speed and precision. 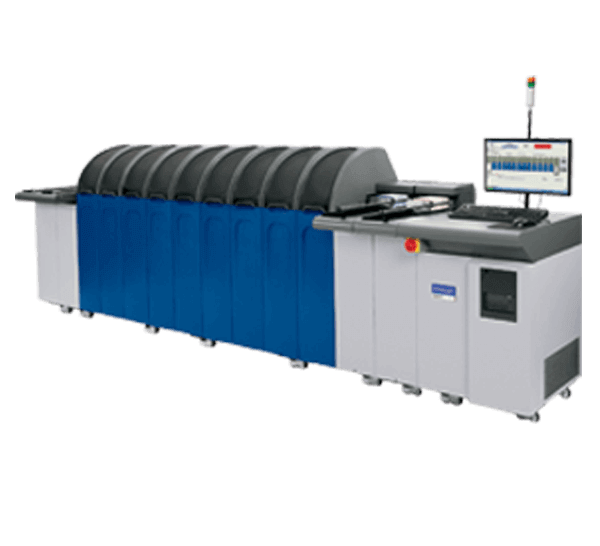 Laser technology is common to that used in the Datacard® MX Series card issuance system. Self-contained design – no external power supply or cooling required. Securely program contactless chips embedded within passport booklets. Chip and antenna may be embedded within the data page or booklet covers. Supports ISO 14443 A/B level 2, 3, and 4 specification. Choice of Datacard or Smartware brand couplers. Personalize the paper pages of a passport booklet in color or black-and-white with exceptionally clear and crisp inkjet printing. Pre-print section flexes the book to ensure a very flat printing surface; a fan dries the ink after printing. Vision registration provides accurate, consistent print alignment. Supports traditional dye inks as well as fully pigmented inks. Large-capacity ink cartridges reduce downtime. Fuses a secure thin film overlap to the personalized data page to protect from tampering and increase durability. Thin film overlap supply is registered (indexed) to the passport page. Datacard® Intelligent Supplies Technology™ reduces waste and enhances operational efficiency. Choose from a variety of material suppliers. Closes personalized passport booklets prior to final output. Stacks approved and rejected booklets in separate trays. Controller and data file can support automated sorting using multiple output modules. Controller software automatically prepares file for remakes, if desired. Tray capacity of 100 passports (32-page booklets). Options for locking hoods and covers throughout.